Rec: October 2001, Kobe Shoin Women�s University Chapel. Bach�s keyboard partitas were his first published works, his opus 1. These six suites were actually the last suites Bach wrote for keyboard, and owe a great deal to French influence. 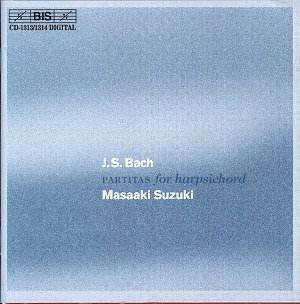 Masaaki Suzuki continues his exploration of Bach�s keyboard works with these fine pieces, performed on a beautiful sounding harpsichord. The first thing that strikes the listener of this set is the extraordinary sound both of the instrument (a Ruckers copy) and the recording itself: the harpsichord is miked close enough to pick up the rich range of the instrument and its subtle harmonics, but the sound is not overbearing. Suzuki plays the first partita at a leisurely tempo, with the prelude flowing naturally, the allemande following in perfect time, the corrente picking up speed just the right amount, the sarabande played in a stately manner with fine ornamentation, the minuets graceful and the giga lively. All the movements of all six partitas follow in this same manner - neither hurried nor slow, Suzuki seems to have found the ideal tempi for these works. Slower than most recordings, with all repeats played, this set is just over 160 minutes - one of the longest harpsichord recordings available. While Suzuki seems to master almost every movement in this set, he plays the finest performance of the long allemande in the fourth partita that I have ever heard. Slow and sinuous, sensuous and organic, he plays this, the heart of the partitas, as it should be heard. For this movement alone it is worth buying this set. Something grabbed me as I started listening to this recording. The sound is certainly one of the elements that got me hooked, but there is something subtle in the way Suzuki plays that goes beyond the music. This is actually a bit surprising - while he is one of the finest conductors of Bach�s sacred cantatas, his solo harpsichord recordings, while excellent, have never gotten me excited. But there is magic in this disc. These works, that I know very well, came alive in a way no other performer is able to do. My previous favorites for these works were the recordings by Edward Parmentier, on Wildboar, and Trevor Pinnock, on Haenssler. But Suzuki comes in at the head of the pack. Whether this recording is "better" than the others is very subjective, but it definitely belongs up in the top three. The naturalness of his playing, the appropriateness of his tempi, and his limited and subtle ornamentation all work together to make this a nearly perfect recording. This is one of the finest recordings of these works available on harpsichord. Suzuki performs these works in a very personal way, but his interpretation works perfectly. A must-have recording.